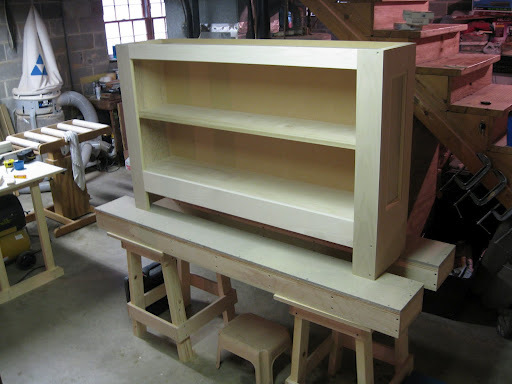 I have reached a small milestone with this project which is the completion of the face frame for the lower bookcase. It at this point that we start to see what this project is going to look like. Pack a lunch, this is a long post. Yesterday was another long stretch in the workshop. It started out with a trip to the Home Depot to purchase two six foot pipe clamps. I have been resisting the urge to purchase longer clamps, but I had a slight problem pop up that required one to fix it. The latest edition of Fine Woodworking’s Tools and Shops special issue has a review of parallel bar clamps, so I took a quick look at their recommendations. I went to Woodcraft on-line to see what they had (example here). I saw few options for six foot long clamps and those reviewed by FWW looked to be more expensive anyway, so I went with the clamps that I have used for more than 20 years: two three-quarter inch pipe clamps. until the face frame becomes square. Norm again. I first saw this type of joinery on Norm’s New Yankee Workshop PBS series. 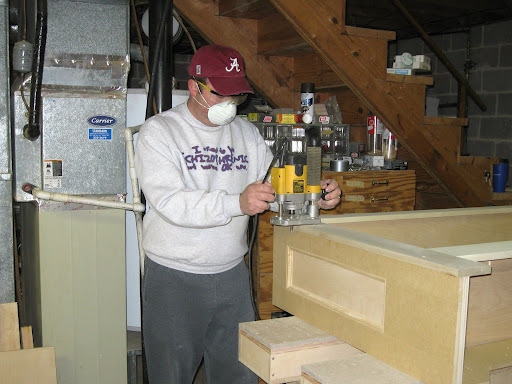 I use Kreg products for this process. Ready to be attached. Note the location of pocket screw and biscuits. Now that the face frame is completed, it is time to attach it to the bookcase. This took considerable thought and planning because the face frame is rather long and alignment is the utmost importance. 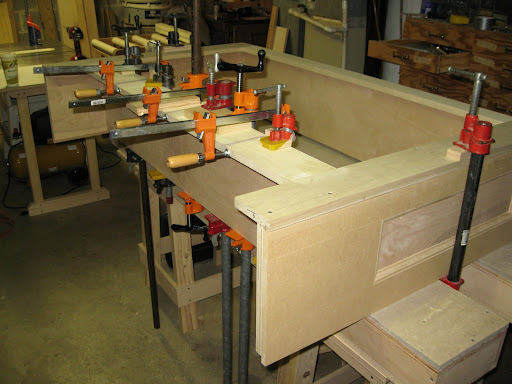 I did not have enough clamps to clamp up everything, so in addition to clamps, I relied on screws which would later be covered by molding and pocket screws which won’t be seen either. I also used biscuits along the left and rights sides as well as the lower shelf. This may seem like overkill, but to have all the face frame joined tightly to the box of the lower bookcase, all of this is necessary. I don’t want any cracks that have to be filled. Glue-up choreography. After a dry run with clamps, screws and biscuits, the actual glue-up is completed. All the planning meant that I could successfully spread glue, lay the face frame in place, attach screws and the various clamps, and wipe away glue squeeze out with out becoming a nervous wreck. This is really a two person job. Note in the photo above that I am using several short pipe clamps. I bought these short pipes a few years ago and seldom use them, but they were very handy for this glue-up. Trimming the edge. A rare action shot of me. 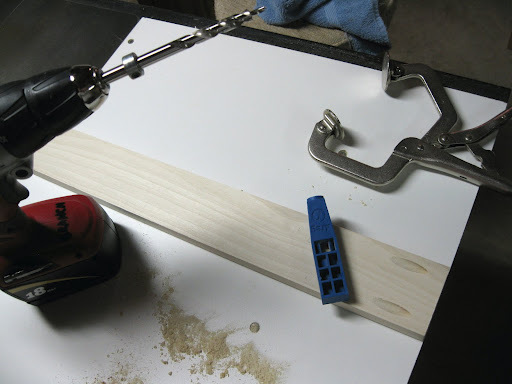 I use a flush trim bit in my router to cut away the extra width of the stiles. This makes a giant mess on my shop floor. I am thinking of some sort of stand that I can attach a hose for my dust collector to catch the dust from such an operation as this. What it will be. 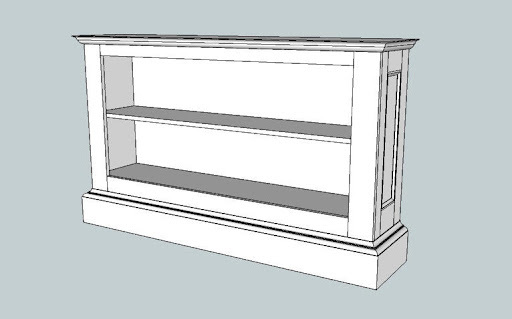 Here is a view of the Sketch-Up drawing of just the lower bookcase. Remember there will be an upper section as well. How it currently looks. 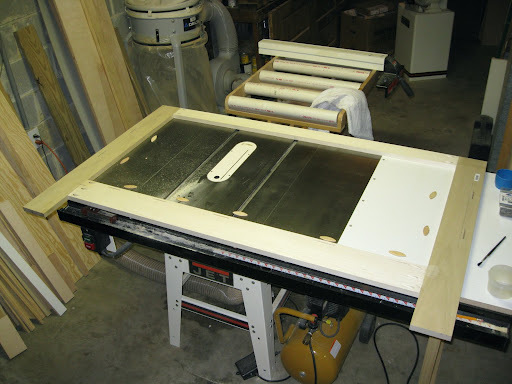 The adjustable shelf is in place and the project is starting to look pretty good. 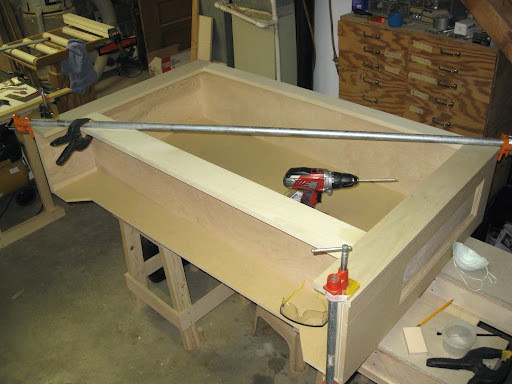 Coming up: this sounds like something a TV announcer would say: “In our next episode of the Scott Bookcase, see the base moldings being applied.” Stay tuned. To see all the posts on this project, click here. That is some serious work there Jeff. I am really enjoying following this piece. Were you smiling under that facemask when Jana was taking you picture?